Parents know their children best. Many children and adults may feel better when they are prepared for things like a doctor’s appointment. If your child tends to worry, it may seem like it would be better to avoid talking about it in advance. However, children should still know what to expect, so in some cases you may prefer to talk to them right before the visit. Withholding information may lead a child to be more nervous about the “unknown” or feel lied to. Younger children have a hard time understanding timeframes like “tomorrow” or “next week.” They do best when a discussion happens closer to the visit. Older children can be prepared up to a week before the visit, giving them time to process and ask questions. Parents may find it helpful to start a conversation about a doctor visit using a book. Look for one with your child’s favorite character. Reading the words and talking about the pictures will help you learn what your child understands about the visit. More importantly, it is a chance for your child to ask questions and for you to explain any misunderstandings. Always offer the correct information if you know it, but if not, let your child know that you will ask the doctor during the appointment. Use a toy doctor kit with a favorite doll or stuffed animal as the “patient.” Your child can also pretend to be a doctor with you as the patient. This can help your child to explore different aspects of going to the doctor. It also offers an opportunity to see what your child already knows and where there are misunderstandings. You can even have your child bring a “patient” to the actual appointment. Sometimes a doctor’s office will honor special requests. While there is no option for examining an ear that may be infected, there are other things that may be offered. One example is letting your child choose which arm to check blood pressure or if they can choose to sit or lie down for a particular portion of the visit. During a doctor’s appointment, ask the staff about any options you can offer your child that might make it a more pleasant experience. Try to avoid asking yes/no questions, as “no” may be a challenge. For example, “Are you ready for your shots?” would most likely receive a “no” as a response. Following a statement with “Okay?” will also open the door for a child to say “No” when there may in fact not be a choice. Be specific when you talk to your child about what to do during an appointment. Let your child know what to expect at the doctor’s office and what is expected of them, such as what happens during check-in, measuring height and weight, and the doctor coming into the exam room and looking at different body parts. It is important to talk with the doctor and staff during a visit. If your child is particularly anxious about something, you should let staff know in advance. 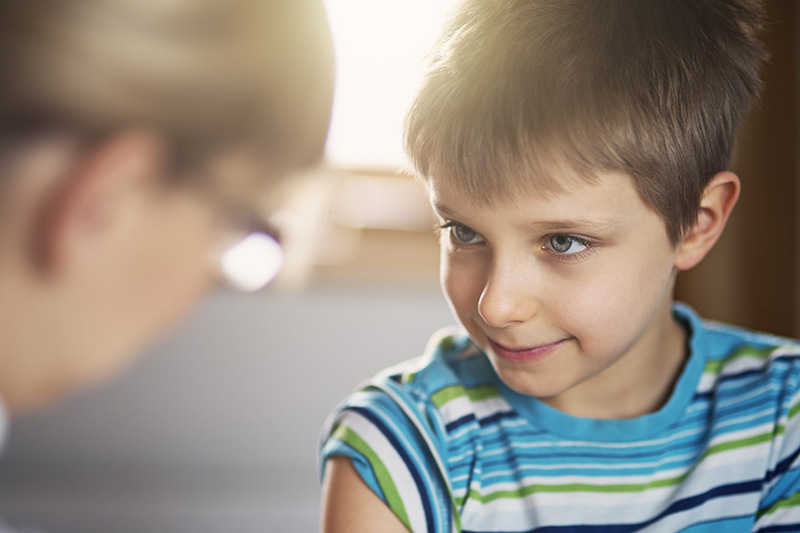 If your child is comfortable talking about their concerns, encourage them to do so. Parents should also remember that children will recognize nonverbal signs of your own fears. If you are nervous about going to the doctor, children will sense that. Be brave and a positive role model! Learn about Lifespan's Pediatric services. Angela Silveira is the manager of child life services at Hasbro Children’s Hospital. Child life specialists work in various areas of the hospital to support children and their families through a hospital experience.